March began very quickly. I can’t believe that a week has already passed us by. We have been very busy in the shop. The T-shirt class the last week in February was a lot of fun. Five ladies gathered together to learn how to piece a T-shirt quilt of their own. Then just this past weekend three individuals joined me to learn how to piece their very first quilt. New fabric is starting to come in. There should be new westerns and the first digital print arriving this month. Whew, I now know why I’m tired. This week the Twist the Night Away BOM club and Second Saturday Sampler group will meet. Saturday also begins Spring Break in Laramie and we spring forward the clocks. Later in the month, there will be a class on making a Rag Quilt. 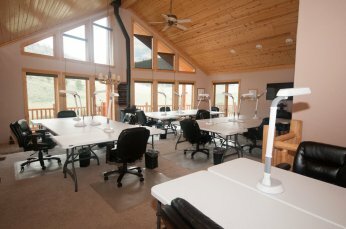 The class is scheduled for March 25th from 9-5:00. Check out the website for more details. 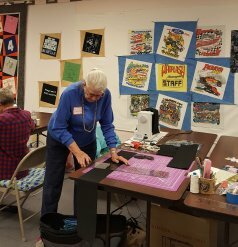 There are several other opportunities to join us for sewing and fellowship with the A Team and Friends and Late Night Quilters. The Springtime in Rockies Shop Hop is coming up next month on April 7th and 8th at The Ranch. Our theme for this year is all about tote bags! Big ones, little ones, funny ones, short ones, tall ones. Design your own or use a commercial pattern. To participate, fill out an entry form and submit it to a participating quilt store with your tote bag by April 2. Totes will hang at the Springtime in the Rockies Shop Hop. Gift Basket Prizes awarded: $75 1st; $50 2nd; $25 3rd. Totes and prizes can be collected from your participating shop after the show. The tote must be made by the entrant and it should have been made in the last 6 months. There is still space left in the spring retreat May 18-21, 2017. This is the only retreat that we will do away from the shop this year, so don’t miss the chance to sign up. The retreat house provides sewing tables and chairs, your own bed, pillow, bedding and towels. Most beds are large twins. There are two kitchens, four bathrooms, two living rooms, and two TV areas. There are irons and cutting tables available however you may want to bring your own cutting mats. Watch the website calendar and Facebook for details on classes through June. If there is a class you would like to see please let us know. I do try to add them to the schedule when I can.